The ring can be ordered with a color of your choice. 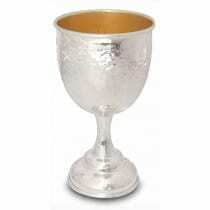 The making of the cup combines traditional silversmiths technics with modern materials and production methods. The cup is Heavier than the average kiddush cup and gives a wonderful feeling to the person who holds it.